We just heard the story where Christ comes to a well, meets a woman and asks for a drink, and I think it's a bit strange that—he's asking for a drink, he needs a drink—but the discussion turns away from these things. They don't continue to talk about water, but as the discussion went on, it became more and more about worship. She said, "We Samaritans worship here, and you Jews say we need to worship in Jerusalem." That's interesting, don't you think? That you're there, you're in the heat of the day, and yet this woman starts talking about worship. There's a reason for that, because worship is really important: how you do it. How we worship and what we do when we come together to pray is really important. Christ tells us that people will worship in spirit and truth. And you know what? That's what we do here, because when we gather together, when we celebrate the Divine Liturgy, the priest will pray that the Holy Spirit come down upon us—that's everybody here—and upon the gifts here presented. So we worship in the Spirit. And we worship in truth because, just like Christ has said, "Where two or three are gathered in my name, there I will be." And we know that Christ is the truth. So we come here to celebrate the Eucharist by worshiping in spirit and truth just as Christ told the Samaritan woman. And we come here because this is what God told us to do. He told the disciples, "When you come together, do this in remembrance of me." He showed them how to worship: to come, to break bread, to bless the bread, to bless the wine, to partake of the body and blood of Christ. And this is what we do here. It's really important that we do this, because God told us and showed us to do this, and he showed us how to do it. So we come here to do this, to fulfill the words that Christ said. We come here, we worship in spirit and truth. We pray, and the Holy Spirit transforms the bread and the wine into the body and blood of Christ, and we partake. This is our worship. This is Christian worship, and this is what we do. Like I said, it is so important that even in the heat of the day, being tired and thirsty, and the woman having other things to do, they talked about worship. So we must always, always be careful about worship. We come here, we pray, and we sing. To do what Christ said that we should do, because in this way, not only are we fulfilling his word, but we are sanctified, we are blessed, and so let us always give thanksgiving and glory to God: the Father and the Son and the Holy Spirit. As I was saying to the children earlier, worship is important. But why is it important? What makes it so important that even in the dry desert, in the desert heat, the midday sun, the conversation would turn to that? The thing is that, as human beings, the way that we are created, we cannot help but worship. And the question is, then: what do we worship? It's not by accident that football stadiums have been referred to as "modern cathedrals," because it is, for many people, a worship experience. There is, I think, no other explanation for the fanaticism or the maniacal fervor with which some people follow their sports teams and they live and die with their success and they attach so much importance to certain events that we hear of players receiving death threats for not playing well or for involuntarily injuring an opponent. It is this level of involvement that makes the sports to many people a religion. But it's not just sports. There are many other things that we can worship, like we could worship politics and ideologies. We can worship money. We can worship our bodies and spend all our time and money making sure that we look as young as we possibly can. There are so many things, and this is part of Christ's warning when he teaches about the kingdom of heaven, because we are worshipful beings, and we need to make sure that we worship God. Everything else… There are good things. There are other good things in life that we love, that we devote time to, but we need to make sure that, whatever those things are, we worship God. That means that we take time to come and be here, form the body of Christ in worship. That we spend time with God. That when we make decisions in our lives from all those other things that are good but not primary, that we always keep that question in mind: Is this for my salvation? Is it for the salvation of my family? Is it going to lead me closer to God and his kingdom. Worship is important for that reason, and especially when there are so many other things we can worship and that we do worship in our society. And I think there is something there, something that's missing in a large part of our society that we can offer to it. 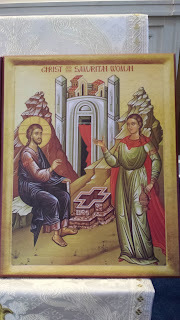 Last evening in our discussion in our Introduction to Orthodoxy series, someone mentioned that the Orthodox idea, the Orthodox understanding of who God is is different from what that person had experienced outside of the Orthodox Church. I think that is an important thing for us to remember. We see in the epistle reading today that the apostles spread the word of God and people were converted. I think if we recapture that understanding of God, if we are able to preach the loving God we believe in in Orthodoxy… We say at the ending of so many of our prayers, "For you are a good and loving God." We take to heart and our theology, our hymns, our prayers are infused with the understanding that "God so loved the world that he sent his only-begotten Son." Yes, Christ will come again to judge the living and the dead, but God is the loving and merciful God who did everything for our salvation. And I think, unfortunately—and I'm not here to judge or condemn any other Christian body—but it seems that the "God" that a lot of America encounters in the encounters with Christianity is not the God of love, compassion, and kindness. We see this perhaps in the caricature of the Christian God that's presented in the media, for one thing. That is not the God we believe in, but that God is the God of salvation. That is the God that we need, that our neighbors and society need. So let us not be shy about our faith. Let us not be timid about our worship. Let us, if we have the opportunity, talk about our faith. If we have the opportunity, invite others to see who God is, the God we worship, here in our holy Orthodox Church. So perhaps we won't be able to... but by God's grace—God works in mysterious ways—we may be able to say, as St. Luke says in the Acts of the Apostles, that many were brought to Christ because they heard this message of hope, of love, of the compassionate God who came and who, on this one day, sat in the heat next to the well of Jacob to bring this one woman, and through her that entire village, to salvation. To this God, the God of mercy, love, and compassion, let us always give thanks and glory: to the Father and the Son and the Holy Spirit. Help, my wife has a smartphone!